Home to the original wrap-around sunglasses, Baby Banz is in the forefront of the children's safety market and is on the cutting edge of head to toe protection for children ages 0-10. Send the kids off to school in style with their JBanz. Jbanz offer the same quality lenses and polycarbonate frames without the concept of the permanent band around the back of the head. Cleverly designed, Jbanz come with a matching neoprene case and Matching Neoprene Band (removable) for safe keeping! Offering a variety of colors and designs including Pink, Black, and Blue, the JBanz will keep their eyes protected and their style in tact! Features UV400 polarized lenses for ultimate protection on those little peepers. It is so important to protect your children's eyes similarly to how you do. Are you wearing sunglasses? Then I strongly recommend your children are at the same time. If your eyes are being bothered, so are theirs. Just this year we have become more aware of the need for the kids to wear shades through companies like Baby Banz and others. Each of my children now own a pair of quality sunglasses like these. There are a lot of copy cats, or discount varieties that aren't protecting at all. Just having colored lenses isn't the protection your child needs. 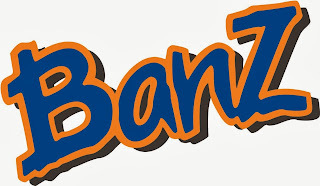 These Jr Banz are very comfortable, durable and stylish! They sell for $24.99 which is a small price for the investment in your child's eyesite. They come with their own case for safe keeping and a band to help them stay on for younger children. Much more than just looking cool.. which of course he does!, the sunglasses are giving his eyes the protection they need from harmful sun rays. Winter often time is worse for sun damage as you think you don't need to protect your eyes when it is cold outside. With the reflection off of the snow and ice, the sun damage is just as bad if not worse. Gear up for those bright winter excursions by protection their little eyes! These Jr. Banz fit ages 4-10 comfortably. Enter to win a Pair of Black Jr BanZ ! The Short Sleeve UPF 50+ Rash Tops 2013 would be useful. I would be interested in trying out the swim goggles also. I would love to try their NEOPRENE WETSUITS.